Expansive Clay soil can be found across the nation, but is it most prevalent in Middle America and in the southwest. Geotechnical Engineers refer to Expansive Clay soil as “Fat Clay”. This type of expansive clay soil has a unique property from other soils. Fat Clay increases in volume as soil moisture increases and shrinks when the soil becomes very dry. 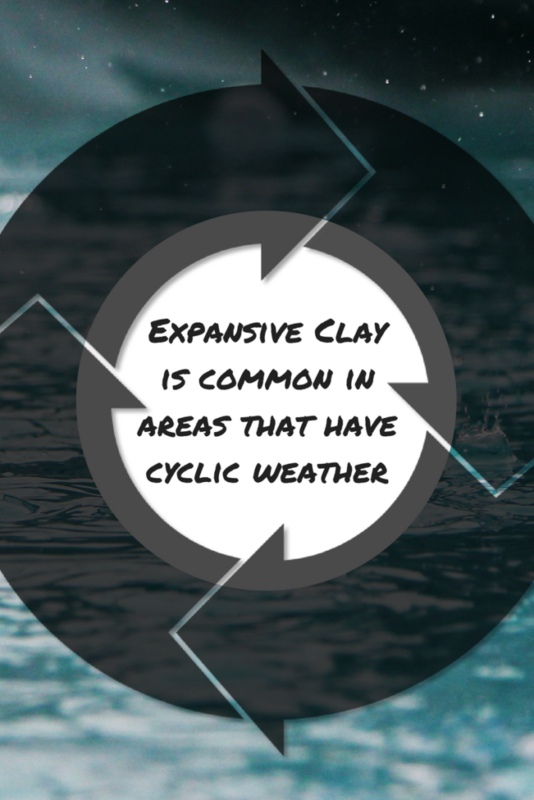 Many people in other regions have never heard about Expansive Clay simply because there is sufficient moisture to keep the clay adequately hydrated throughout the year. If there happens to be a prolonged drought in these areas, suddenly foundation failures begin occurring. In the south central USA the problem of Expansive Soil is well known. The climate there is cyclic. Sufficient rainfall occurs from late autumn until the beginning of summer to keep the soil adequately hydrated. Then, extremely hot summer months follow with very little rainfall. Due to this cyclic climate, Expansive Clay is more active in these areas. This is not to say that other areas of the country are immune to movements caused by these Expansive Clays. Generally, Expansive Clay becomes active and noticeable when drought conditions strike an area with Expansive Clay soils. Expansive clays contain minerals such as bentonite or vermiculite that increase in volume as they absorb moisture. Soils with high bentonite content can have as much as a 30% volume change between their dry and saturated conditions. One can get an idea of the nature of Expansive Clay soil by observing a cellulose sponge. When the sponge is fully dry it is quite rigid and hard to the touch. By adding only a small amount of water to the sponge one can see the sponge increase in volume and become slightly soft. Once the sponge is fully saturated it is very soft and has reached the maximum volume. This, in generally, is the way Expansive Soil works. Structures built upon Expansive Soil are subjected to the movements of the soil when there are variations in soil moisture. Slab on grade foundations and foundations built on shallow footings with short stem walls are the foundations most susceptible to distress due to these moisture induced soil movements. Sometimes people ask, “Why doesn’t the structure simply rise and fall with the soil much like a boat does with the changing tide.” A structure supported on Expansive Clay cannot react this way because the soil is not fluid. The foundation is being subjected to soil movements only at the perimeter where the soil is exposed to the climatic elements whereas the areas beneath the slab do not experience these soil moisture variations. The result of this Expansive Soil shrink-swell cycle is the foundation perimeter moves upward relative to the interior when soil moisture is elevated, and moves downward when the soil dehydrates. In areas where there is an annual climatic wet and dry cycle, the foundation tends to “ratchet down” slightly with each wet/dry cycle. In other words, the upward movement during high soil moisture is less each year while the downward movement is slightly greater each cycle. Engineers usually say that people living in places like Texas, Oklahoma, Kansas, etc. will all eventually have foundation sproblems due to this cyclic effect on the foundation. What can you do to mitigate these movements? You can do something that soil engineers call “Foundation Maintenance”. “Foundation Maintenance” is a process where the property owner attempts to maintain a constant level of soil moisture at the perimeter of the foundation throughout the year. When a drought occurs, supplement foundation soil moisture is necessary. In places where climate and expansive soil work together to create foundation settlement, “Foundation Maintenance” means the owner must insure that proper drainage is always in place. Standing water at or near the foundation perimeter cannot be allowed to occur. 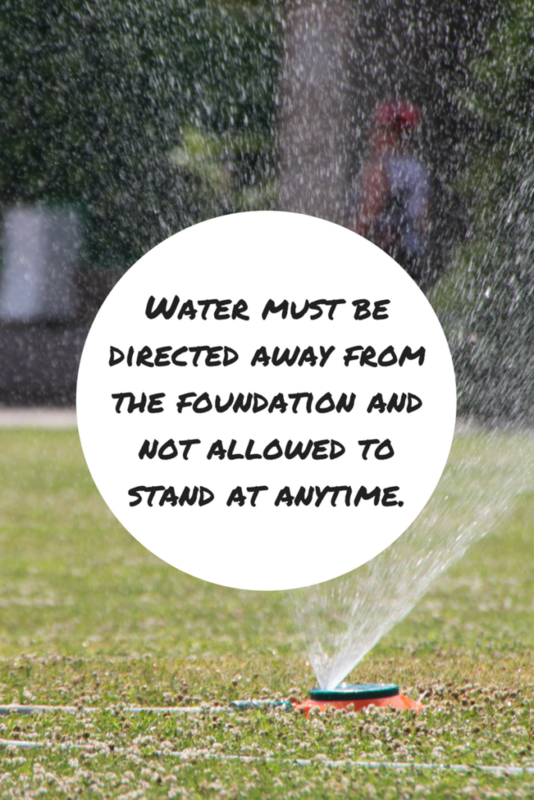 Water must be directed away from the foundation and not allowed to stand at anytime. For example, planter beds MUST not be constructed below grade adjacent to the foundation and a planter border must not be in place that restricts water from flowing away from the perimeter of the foundation. Similarly the house must have roof guttering and down pipes to capture the rainwater during rainy months. The down pipes should not discharge at the foundation perimeter. They MUST be directed away from the foundation either by extensions or by underground drainage piping. This prevents the soil from receiving too much moisture adjacent to the foundation perimeter from rain events. Controlling excessive soil moisture at the foundation perimeter prevents excessive soil expansion, which is called “Heaving” by engineers. The other task required for proper “Foundation Maintenance” is to supplement soil moisture during dry periods and during droughts. The key here is to begin the treatment BEFORE serious soil dehydration begins. This can be done several ways. Normally a properly operating sprinkler system adequately supplements the soil moisture. When the grass and flowers are thriving, and there is no ponding water after watering, there is usually sufficient soil moisture content near the foundation. Recently there has been a trend to restrict irrigation in residential areas in order to conserve water. It is extremely important that the moisture balance at the foundation perimeter be maintained even during water restrictions. It is recommended that soaker hoses be used provide moisture balance when lawn watering is restricted by authorities. Soaker hoses do not use much water and do not need to be used for long periods of watering. In addition, the water from soakers is supplied directly to the soil so there is little or no evaporation, or wasted water. The recommended method for using soaker hoses is to begin the process when there has been no rain for one week to ten days. Do not wait for cracked and dry soil. The soaker hose should NOT be placed directly at the perimeter of the foundation, but rather be placed at a distance away from the foundation. The exact distance depends upon the depth of the footing. The hose distance from a foundation should be equal the footing depth. If one does not know the footing depth; a general rule of thumb is to put the soaker hose at two to three feet away from the footing. The amount of watering depends upon many factors, so a specific watering time cannot be recommended. As rule of thumb, one should water the perimeter gently until a small amount of water is seen on the ground surface near the soaker hose. Water the dry soil near the foundation approximately once per week or as needed in severe drought conditions. Never put water into a crack that appears between the soil and the foundation. Such a crack indicates that the soil is seriously dehydrated. Should such a situation be experienced, use the soaker hose method explained above, but water for a short time every other day until the situation is corrected. Never water at a crack or water for an extended time, re-hydration of seriously dry clay soil is a slow process. There is another serious problem that dehydrates the Fat Clay. This dehydration is caused by trees and shrubs planted too close to the foundation perimeter. These plants have feeder roots that can extend under the foundation and remove moisture that cannot be replenished. Overgrown shrubs need to be removed not only to prevent continued soil dehydration at the foundation, but to open the area around the structure for security purposes. Huge trees are also a major problem. A way to determine if a tree is affecting soil moisture below the foundation is to observe the canopy of the tree. If the canopy extends over the roof line, then it is likely the feeder roots extend an equal distance under the foundation. The solution to this problem, short of removing the tree, is to prune the shallow feeder roots going toward the foundation. A contractor can cut away a six inch section of each root that goes under the foundation, and then a trench is dug at the location where the root was cut. A barrier should be installed when refilling the trench with soil to prevent the root from returning. What to do if one finds sloping floors, misaligned doors and windows, exterior crack and/or separations? Usually foundation underpinning is indicated to recover lost elevation. It is important to have a contour map of the interior made to verify the direction and magnitude of the foundation movement. A knowledgeable company or a registered professional engineer will plot the foundation movements on a drawing to determine the repair plan and to suggest what likely caused the foundation movement. Engineers have seen foundation repair salesmen recommend underpinning on structures that have heaved (moved upward). The heaving is usually due to insufficient drainage or plumbing leaks allowing too much moisture at the foundation. If heaving is suspected, NEVER install underpinning because drainage/plumbing repairs generally will dramatically reduce foundation movements caused by the heaving. 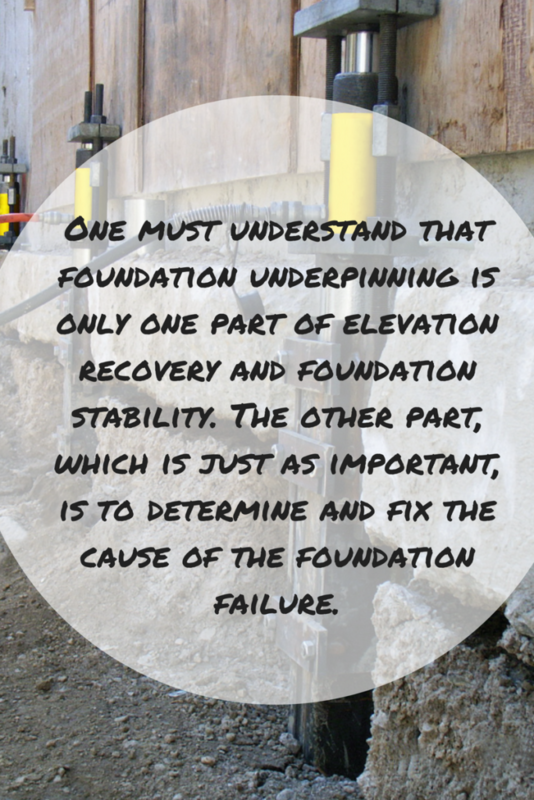 One must understand that foundation underpinning is only one part of elevation recovery and foundation stability. The other part, which is just as important, is to determine and fix the cause of the foundation failure. The cause of the movement could be excessive soil moisture or soil dehydration at the foundation perimeter, or both. Foundation repair will not be successful without determining, and fixing, the cause of the movement. Avoid foundation repair companies that only want to sell underpinning and make no mention of the cause of the failure and do not recommend remediation of issues that likely caused the settlement. All repairs needed to maintain moisture balance are necessary to insure future foundation stability. Quality underpinning must be installed to a suitable stratum of soil that is durable and stable below the undesirable surface soil. The structure will be supported on piers, or “stilts”, that are bearing on a solid, stable layer of soil or rock far below the surface. One must keep in mind that underpinning prevents future foundation settlement and the underpinning can recover lost elevation, but the Expansive Soil at the surface can still cause heaving and foundation instability if moisture control improvements are not implemented. The same situation applies for overgrown trees and shrubs with feeder roots that are going under the foundation. The perimeter may be supported by underpinning, but the tree and overgrown shrub roots can continue to dehydrate the soil located under the foundation that is away from the perimeter. As a result, the interior floor could drop or sag in the future if root problems are not corrected. We suggest that you call an ECP certified installer to inspect the structure to determine the cause of your distress, to recommend methods to improve conditions that caused the problem, install underpinning, if needed, to recover lost elevation and to show you how to maintain soil moisture balance in the future.